Serve your friends a bottle of assorted Game of Thrones Beer at your next party, Every order includes one label each of Baratheon, Frey, Greyjoy, Tully, Targaryen, Lannister, Stannis, Karstark, and Stark. These labels are the same design as the beer coasters you love already. I print all of the Game of Thrones beer logos on premium water resistant textured labels to give the labels that professional look while using only OEM ink to bring out the most vibrant colors, and intricate details of the beer logos to achieve the best quality beer labels for your bottles, glasses, cups, and more. 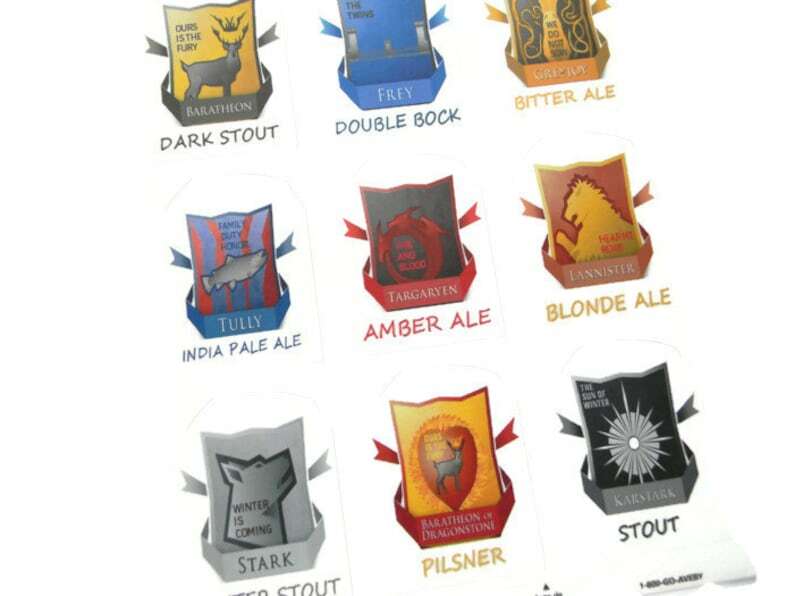 Trendycoasters truly believes that every one of our customers Game of Thrones beer label purchases will bring joy, happiness, and lasting memories every time they enjoy a beer with friends. We believe it so much that we offer a 100% satisfaction guarantee, or your money back. Check out our reviews, and see how happy our customers really are with their Game of Thrones beer labels. Received quickly. Was fun picking the one you wanted to personalize your solo cup. Would of liked it the colors were bolder.